Recognizes a 53 kDa protein, which is identified as p53 suppressor gene product. Recognizes a 53 kDa protein, which is identified as p53 suppressor gene product. It reacts with the mutant as well as the wild form of p53 under denaturing and non-denaturing conditions. p53 is a tumor suppressor gene expressed in a wide variety of tissue types and is involved in regulating cell growth, replication, and apoptosis. It binds to MDM2, SV40 T antigen and human papilloma virus E6 protein. 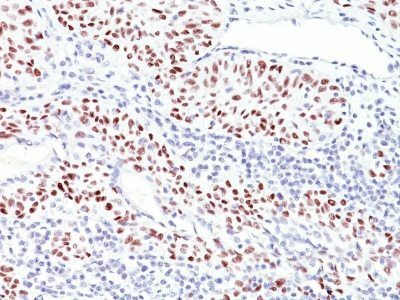 Positive nuclear staining with p53 antibody has been reported to be a negative prognostic factor in breast carcinoma, lung carcinoma, colorectal, and urothelial carcinoma. Anti-p53 positivity has also been used to differentiate uterine serous carcinoma from endometrioid carcinoma as well as to detect intratubular germ cell neoplasia. Mutations involving p53 are found in a wide variety of malignant tumors, including breast, ovarian, bladder, colon, lung, and melanoma. Catalog number key for antibody number 0816, Anti-p53 (TRP/816) The prefix indicates conjugation, followed by the antibody number and size suffix.